This year, during the United N ations Climate Change Conference (COP 17) that started this week in Durban, World GBC is representing the green building community with a series of side events (check the list here). Among them, the Cato Manor Affordable Green Home tour, will exemplify very clearly how greenbuilding retrofit has a significant impact not only in cutting carbon emissions but also in improving people lives. 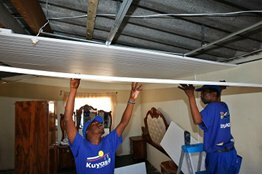 The project, led by Green Building Council South Africa in partnership with World Green Building Council, is a green re trofit of 30 low income houses and involves fitting each home with a solar water heater, insulated ceiling, efficient lighting and heat-insulation cooker. It includes additional “greening” elements such as rain water harvesting – that allows for better water and food security – and planting of indigenous trees . The local community was involved in the process and second hand, recycled materials from the surrounding areas were used for the retrofit. The cost for each home retrofit is estimated at 2800EUR. More information on the specific solutions that were used for the retrofit can be found here. RoGBC sent invitations to the side events to our country delegation to Durban. We were pleased to receive confirmation of participation to World GBC COP 17 side events from the representatives of the Ministry of Environment and Forestry. If a picture is worth 1.000 words, how many words do you think an energy efficient building makes up for? And it’s not just any building, but the location of the Copenhagen summit, Bella Center. RoGBC member company Schneider Electric helped cutting the CO2 emissions for the site of the UN Climate Change Conference. To be more exact, the company modernized some technical installations, including the ventilation and cooling systems, 107 circulation pumps and about 2,000 light fittings. 5,268 energy-efficient light tubes were installed and the heating and lightning control system were automated, so that they adjust to fluctuations both indoor and outdoor and take up only the amount of energy needed. Bella Center is monitored by a building management system that generates hourly reports about the electricity consumption. The Bella Center upgrade prevents about 1,150 tons of CO2 from being emitted every year. Maybe all these numbers don’t seem all that impressive, but think of it this way: the emissions that were avoided by Schneider Electric through the energy efficient system in Bella Center would be equal to about 7 million kilometers on the road in your car. Not bad, is it? That is Schneider Electric’s way of encouraging the debate in Copenhagen and expressing hope that it will leave behind some revelations on how to save the planet, or at least get on the right track by reducing the CO2 emissions and protecting the environment more than before. Read more about the retrofitting of the Bella Center on activeBE.com, the online Schneider Electric Building Energy online community. How would you comment if someone told you that a 38% energy consumption reduction in a huge office building would pay back in 3.1 years? What if this statement came from US experts that were present at the Copenhagen summit? And what would you say if that building was the Empire State Building? This was one of the most exciting aspects of the presentations held during the fully booked Green Café /webinar hosted by the RoGBC, in collaboration with the US Embassy. The session, which was transmitted via Internet from the US Center at the Copenhagen conference, discussed vital examples of “low-hanging fruit” mitigation opportunities that can be undertaken at cost savings by building owners and occupants. Panelists represented ESCOs, Green Building NGOs, building supply and technology companies, and addressed leading technologies and examples of green buildings, obstacles to implementation, and best ways forward in implementing energy efficiency in commercial and residential buildings. Have a look at a slide presentation accompanying one of the talks here. I just returned from a consultative meeting organized by United Nations Development Programme (UNDP) Romania, the Ministry of Environment and the Ministry of Foreign Affairs. 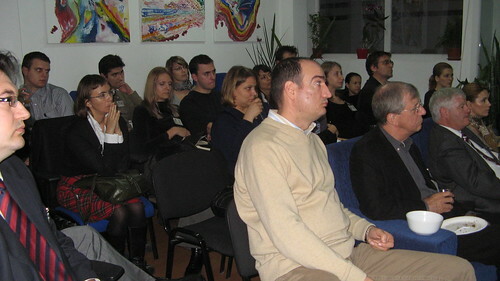 The meeting’s subject was entitled “Romania in the Context of Negotiations for the New Global Climate Change Agreement, Copenhagen, December 2009 – United Nations Climate Change Framework Convention COP 15”. Attendees included dignitaries of the above-mentioned organizations as well as the Ministry of Agriculture, various academic institutions, NGOs and private sector representatives. We as stakeholders were asked to provide concrete recommendations as Romania prepares its position for national and international policy for the post-Kyoto period beyond 2012. 1) That studies being performed to calculate the economic impact of greater CO2 / greenhouse gas reduction commitments should also include the reduced economic risk from greater energy efficiency and energy security. In addition, recognition of the significant contribution of buildings, new and existing, to greenhouse gas emissions must be elevated in the continuing climate change discussions in Copenhagen and beyond. 2) Financing mechanisms that reward green building, green tech, and renewable energy solutions and are paid back by future energy savings are a low cost way for encouraging innovation and helping Romania to prosper from adopting a low carbon economy. 3) Density bonuses, property tax exemptions and expedited permitting (among other incentives) for green buildings can provide better quality investments, sustained economic growth, and, of course, better buildings. A greater amount of green property investments offset the cost of tax reductions to municipalities and promote high-quality jobs. 4) Greater willingness to review and allow environmentally-superior construction materials is necessary to increase the energy efficiency of buildings and reduce their environmental impact. 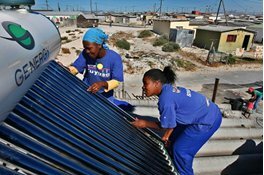 Reaching climate change commitments can be achieved by more innovative thinking and new policies instead of requiring greater spending. 5) Companies should be supported in their transition away from fossil fuel. We must let the market economy function but provide support in specific cases where the environmental costs are not captured by the normal market mechanisms. 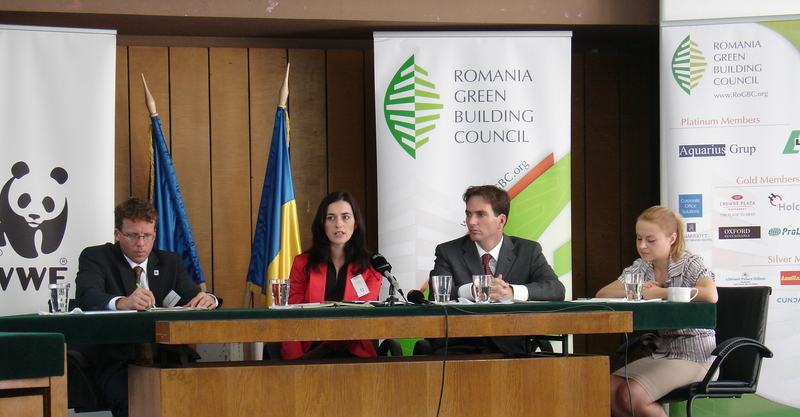 The Legislative Outreach Task Group of the Romania Green Building Council is preparing, in cooperation with WWF Romania a position paper to be delivered to the Government of Romania which will include the above points along with more details on policies and tools to ensure Romania’s climate change response brings sustainable economic growth. Last Thursday we hosted the first RoGBC Green Cafe, on the topic of Sustainable Architecture, with all seats filled by enthusiastic professionals exploring ways to change the construction industry towards a greener profile. As previously announced, the Cafe started with the movie “Last Call for Planet Earth” – which presented interviews with 12 leading architects across the world, who share their vision on architecture that respects nature, give examples of successful green projects, technologies used, challenges and solutions. Afterwards, Florin Dobrescu (Stardome) gave a presentation on sustainable architecture and introduced the concept of passive, modular homes and geodesic domes. Brandon Weidenfeller (Epstein Architecture & Engineering) moderated the discussions that followed. The attendees expressed their opinion on how to present the concept of green buildings in order to make it more “catchy” to the public. Another discussion point was the challenges the architects face in promoting green buildings/ green building concepts to the other parties (RE developer, beneficiary, etc.). Everybody agreed that this slowdown period caused by the global crisis is a good opportunity to study green construction principles and techniques, as the future of the construction industry will rely more on the quality of the buildings, rather than on the quantity of units produced. As they say, “Let’s not waste a perfectly good crisis!“. We were very glad to see your interest in the topic and your involvement in the discussions. We also hope that you enjoyed the movie, the popcorn, the wine and the networking opportunities, . Photos from the event are available here. Or, you can view them as slideshow here. Please feel free to send us your feedback, as well as suggestions for improving future events. The RoGBC team particpated in the Climate Caravan event organized by WWF and Toyota. Pictures will follow in a few days. Here is an article (in Romanian) from the WWF site. The Climate Caravan is on Tour in September! The Romania Green Building Council is partnering with the World Wildlife Fund and Toyota on their multi-city “Climate Caravan” campaign to build awareness about climate change and to discuss actions citizens can take in order to be more environmentally responsible. The RoGBC will supply information on greener homes and construction methods that will save both money and the planet. The campaign targets young and middle aged people and households, including young professionals, all from urban areas and with access to internet/media. 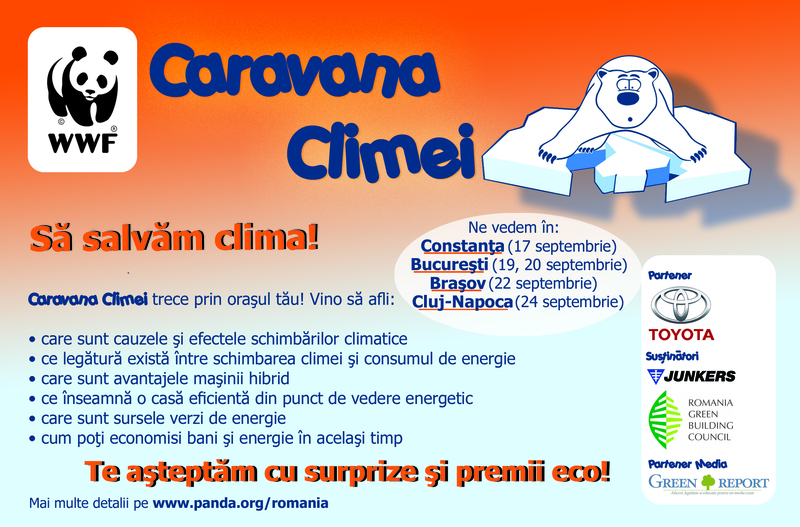 More information will be available on a dedicated webpage that is to be launched on September 1 at www.panda.org/romania . The tour starts in Constanta (September 17), then stops to Bucharest (September 19&20), Brasov (September 22) and Cluj-Napoca (September 24).